Last night (Saturday) the Draconids produced a pretty nice outburst as the Earth passed through clouds of dust left in space by the comet 21P/Giacobini-Zinner, resulting in a short but strong meteor shower. 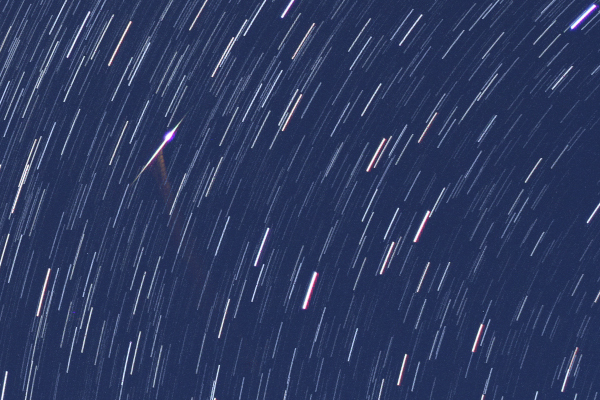 I had my camera outside for approximately three hours, taking pictures continuously (14 sec exposures every 15 seconds), so besides watching parts of the show with my own eyes (while the telescope was working on its own), I also got tens of shooting stars ‘on my memory card’. Unluckily it was almost full Moon, so the sky was very bright, and the Draconids are mostly faint meteors, but I still managed to see 46 of them in 31 minutes, so the outburst was indeed very strong. This entry was posted in Uncategorized and tagged english, észlelés, fotó, meteor, observing, phdinleuven, photo on October 10, 2011 by Péter I. Pápics. Of course packing was hell again (luckily I had better thing to do on the weekend, like cycling, playing with FIFA 12 – call me a child, I do not care :D), and I did not sleep too much during the night (but then almost 5 more hours on the planes, and this was the first time I have flown with a CRJ900). As my observing run starts on Wednesday only, now I have some time to concentrate on photography. 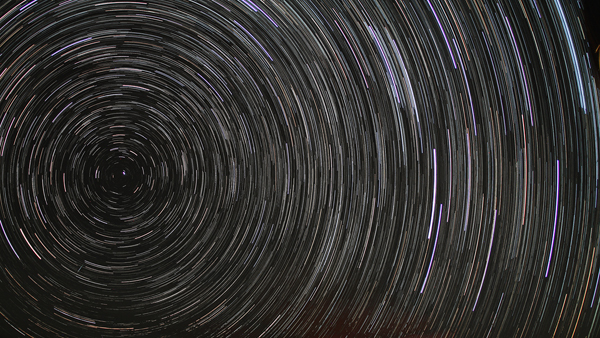 The main goal is to take hundreds (thousands) of images again, and make a new version of my time lapse movie, The Starts of Mercator. And there are always some special things to take additional pictures of :) So lets see what we have here. It was only ‘half moon’ (first quarter) over the Observatory, but it is already very bright. Without the moonlight, you cloud see the Milky Way towards the center of our galaxy on the left side of the picture. 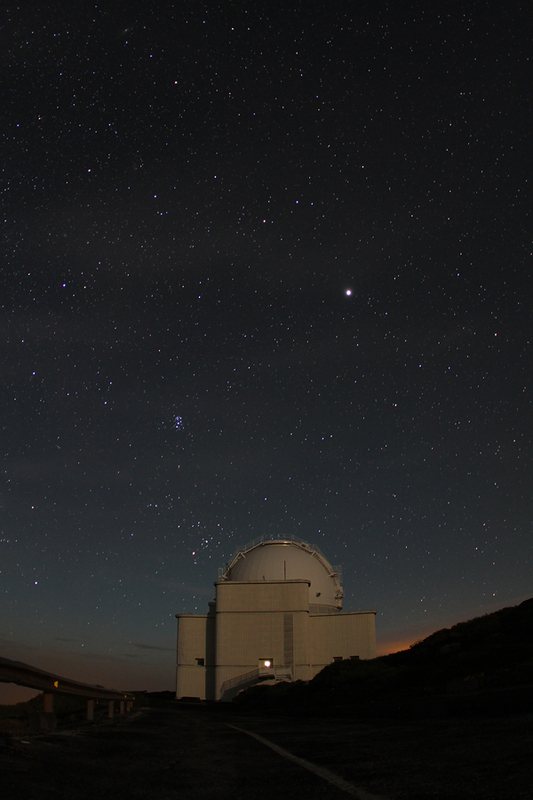 Now it is only visible, if you know what to look for… The bright path on the bottom is created by the headlights of someone driving up to the telescopes, and as you can see the dome of the WHT is open in the bottom right corner. 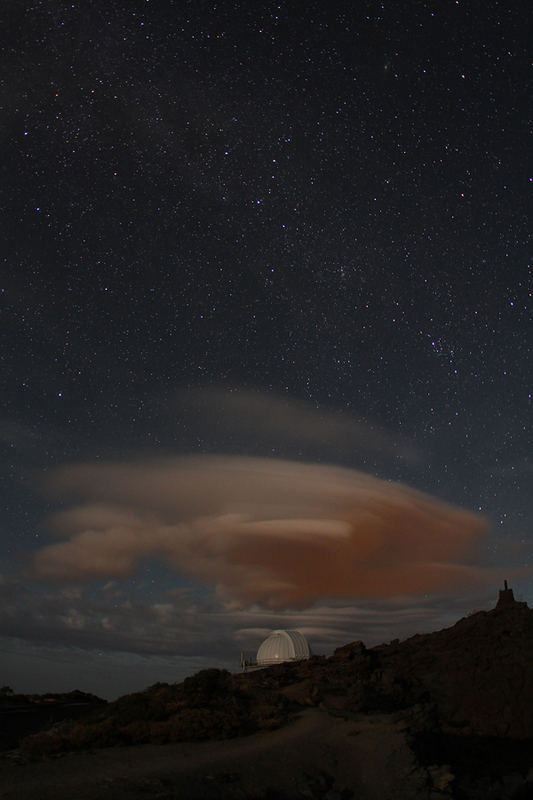 The lenticular cloud stayed for hours there, so I took a picture of it (and a whole time lapse sequence too) with the dorm of the Jacobus Kapteyn telescope in the foreground. Plus you can see the dim, outer part (looking into the anti-center direction) of the Milky Way with constellations like Cassiopeia and Perseus, plus you can easily (if you are/were an amateur astronomer) spot the Andromeda Galaxy in the top right corner. Jupiter (the brightest ‘star’) and some winter constellations rising behind the INT building right before moonset (that’s why the building looks yellow and instead of white). 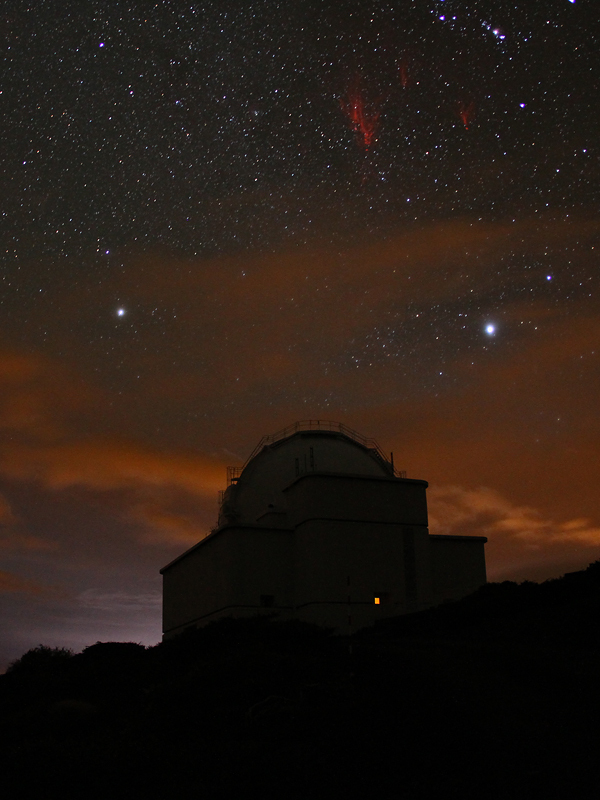 This entry was posted in Uncategorized and tagged csillagívek, english, észlelés, fotó, la palma, observing, phdinleuven, photo, red sprite, startrails, vörös lidérc on October 4, 2011 by Péter I. Pápics. 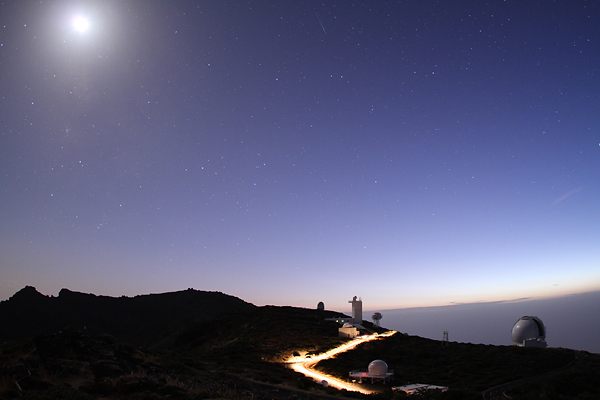 I am back again on La Palma at the Observatorio del Roque de los Muchachos (ORM) – for the 4th time already. 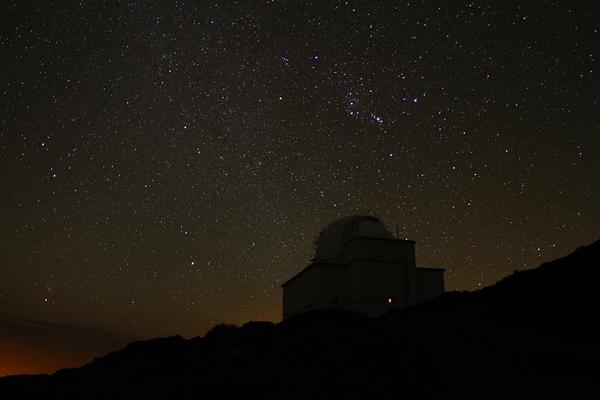 I have 11 nights of work at the Mercator Telescope, then I will fly to Tenerife to continue there with another instrument. As always, I can only say that this island is amazing. Every time I take the taxi from the airport to the observatory, I can not stop staring out the window to look at the landscape. This is the first time I am here during summer, and I have to admit that the temperature is much nicer up here at 2300 meter, than it is in e.g. October. I don’t need my winter coat anymore, and I don’t need to put a kilogram of warm clothes (knee warmers, arm warmers, neck warmer, wind coat, rain jacket, etc.) on when I roll down with the bike on the morning, a simple jacket is enough. So during the day it is typically ~20°C (but it feels much more thanks to the Sun), while on the morning it is around ~15°C. 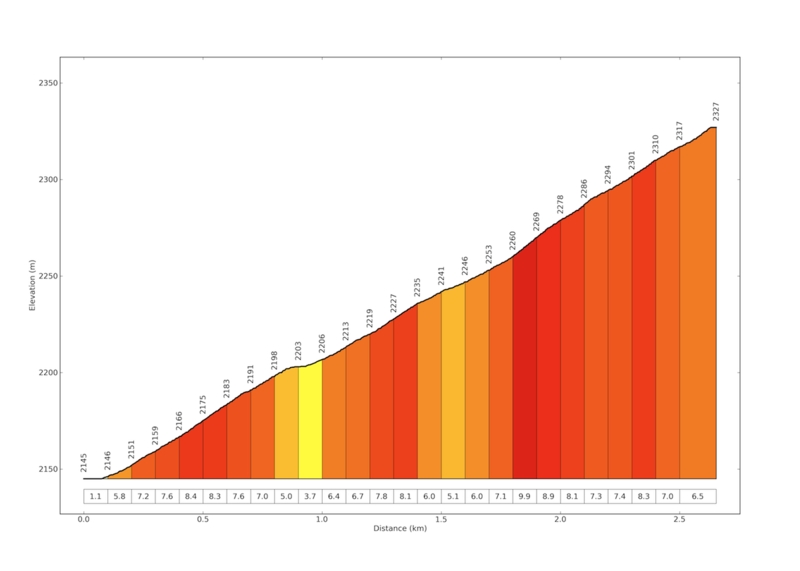 Now again I took my racing bike with me (and I will have a week of cycling after my observing run on Tenerife), so already here I use it every day to commute between the Residencia and the Mercator Telescope. 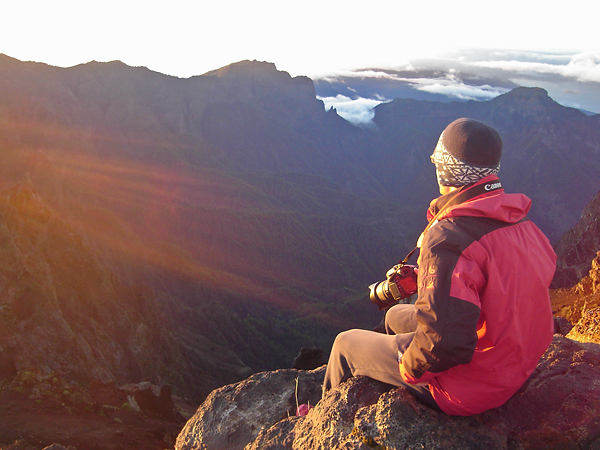 This entry was posted in Uncategorized and tagged bicikli, climbing, commuting, cycling, english, észlelés, közlekedés, la palma, observing, phdinleuven, video on August 8, 2011 by Péter I. Pápics. 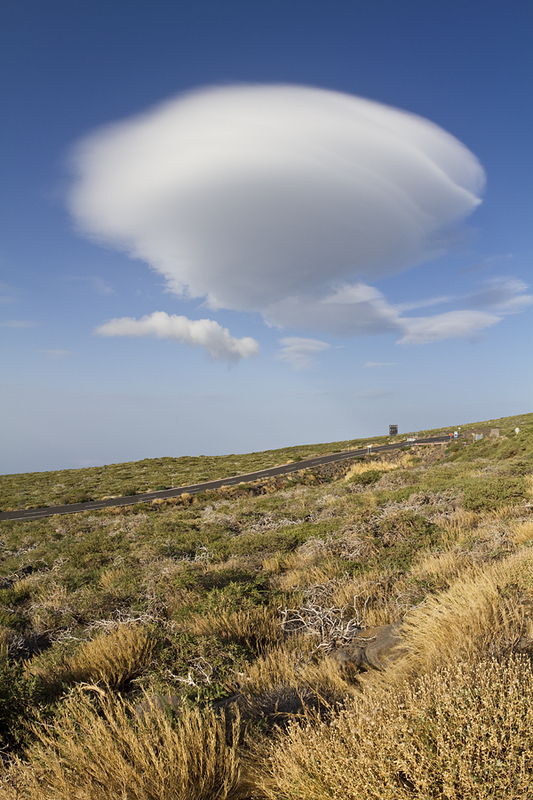 This entry was posted in Uncategorized and tagged english, észlelés, la palma, observing, phdinleuven on May 13, 2011 by Péter I. Pápics. In the second half of the night, when the humidity was again too high to continue with the observations, I held a quite long stargazing session with the “small” Dobson-telescope to the students (and the teachers also ;D). We saw the Andromeda galaxy, the Triangulum galaxy, the Orion nebula (which was really like on the pictures), Jupiter with its dark band and the shadow of Io, etc. 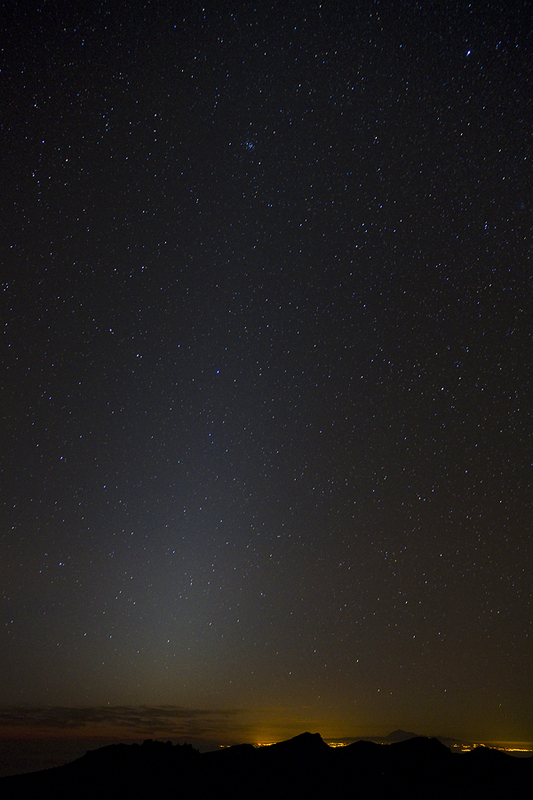 The last night was just long and tiring, with lots of high clouds, and almost no observations made. I am happy that I can switch back to the normal day-rhythm now, because I barely saw the Sun in the last three and a half weeks, and I am extremely tired now (so I really do not understand how did I manage to break my record riding up to the observatory after dinner – maybe the students passing me while waving and horning from the car helped :D). So this is the end of my observing runs on the Canaries, and although it was much more tiring than my spring run on Mercator (hence I am much more exhausted at this point – so writing in English is not that easy anymore), I am still an observer, and I will be happy to take another observing run next spring, or as soon as I can after the winter is gone. But now I really start to miss things from Belgium; the colleagues and friends, the chocolate, proper fries (!!! ), good brown beer, my studio (it is going to be so cold when I arrive home), the flat cycling route along the Dijlekanaal, just the streets and atmosphere of Leuven, and so on. So it will be good to be back. But now I will have some holidays at see level first, which I will use to rest and cycle (I do not know yet how am I going to do these two things together, but we will see). And I MUST spend some time on my paper (still the comments of the co-authors) in the next 36 hours, because I want it to be finished before I take the taxi down to Santa Cruz, to save myself from the stress… Honestly, I thought it would be finished by now, but I had much less energy in the last week than needed (and originally expected). But first of all, I have to sleep. A lot. This entry was posted in Uncategorized and tagged bicikli, cycling, english, észlelés, fotó, la palma, observing, phdinleuven, photo, video on October 18, 2010 by Péter I. Pápics.